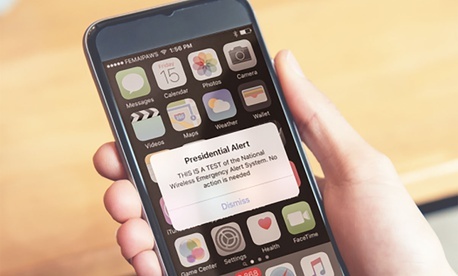 On Oct. 3, a test message was sent to every cellular phone on an American network connected to wireless providers participating in the Wireless Emergency Alerts (WEA) system in coordination with the Federal Emergency Management Agency's Integrated Public Alert and Warning System infrastructure. FEMA estimated that 225 million cell phones received the message. Most Americans are familiar with WEA through its Amber Alert notices and weather notices sent to cell phones. The Presidential Alert—as it was named—was a new test and was covered extensively by the media, but apparently some Americans still didn't know about the message and they were not happy. Dozens of cell phone users complained to the Federal Communications Commission about the WEA test, according to documents received by GovExec through a Freedom of Information Act request. The complaints ranged from one San Franciscan wrongfully citing the Constitution ("This … alert is an unconstitutional seizure of my property (phone)") to one complainant calling Trump "president jackass" and saying FCC chief "Ajit Pai loves to screw the american people over for the sake of Verizon." While many took shots at Trump and his administration, most were just confused and wanted to opt out of the alert. Unfortunately, according to the FCC's website, they cannot. In its FAQ on the WEA, FCC answers the question "Why can't consumers block WEAs issued by the President?" by citing the WARN ACT and explaining that carriers and users can "block all WEAs except those issued by the President." One citizen, however, was unaware of the WARN ACT and complained to the FCC that the alert "is a violation and against the law." Some responding seemed to prefer the old way—the long beep on TV and radio would definitely qualify as "more conventional and ubiquitous communication channels. "—to the WEA method. The alert appears to have prompted confusion in one married Georgia couple as to whether they had defective phones. If so, they do want the FCC to provide them with new phones because Sprint could not help. At least one person saw the media coverage and wanted to complain before even getting the alert, citing the Hatch Act. This Californian was among a few who were concerned that the president would be using the alert system as "propaganda," though the FCC has only used the WEA system to alert citizens of weather emergencies. This is a bigger issue that the FCC has failed to address: Why some did not receive the alert at all, despite being on U.S. networks connected to the WEA system? This is the one complaint that addressed such a problem. Check out the entire slate of complaints the FCC provided Government Executive below. Previous Post | Hope for Reforming Government in Polarized Times?